There was a time in the last year or two when I was into weightlifting. As many weightlifters do, I tried to get as much protein as possible to help maximize my muscle mass by using protein bars, shakes, and the like. I have since stopped lifting, and also discovered there isn’t much conclusive research showing that excess protein really helps develop more muscle. So for the most part I’ve given up on all the protein supplement products. 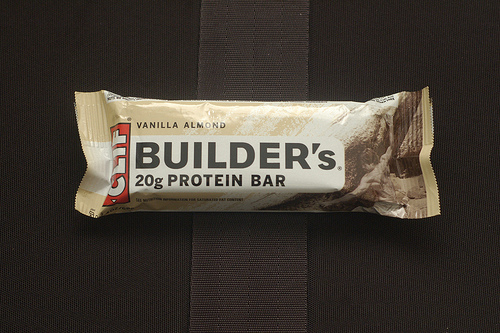 Clif’s Vanilla Almond Builder’s protein bar is the one thing in this category I still eat from time to time, not for the protein but because it’s just so darn tasty. Not surprisingly, it also happens to be quite sweet. My first feeling when removing this protein bar from the wrapper is that it’s really *big*. It’s solid rectangular shape hints at the bulging muscles you might get with frequent consumption of it (of course, assuming you do the necessary weight training). On its way to your mouth, this solid mass of protein and almonds gives off a very strong scent of vanilla, whetting your appetite. As you sink your teeth in, you put in a little extra force to bite off a chunk, after which your jaw gets a real workout on chewy, sweet stuff. This bar is composed of three parts. The outside is coated in a sugary vanilla frosting that is the star of the show, thick on the bottom but thinly painted on the top. Within there are two layers, the larger bottom one comprised of tiny almond pieces that are held together by something sticky with the appearance of brown sugar. This has only a mild sweetness if eaten on its own, pale in comparison to the candy-like frosting. The top layer, partially visible by the thin coating on top, is made of very dense, chewy soy protein isolate. It doesn’t have too strong of a taste on it own. In fact I’m impressed how they’ve managed to cover up the texture and taste of powdered protein, which is not exactly what I would call appetizing. This bar does an excellent job at filling you up so you can continue on with exercise. In my case it filled me up for an hour or two, if not longer. A minor side effect is that it really makes you thirsty. I typically drink a glass of cold water while eating it, and another after I’ve gobbled it up. The flavor tends to stay around in your mouth for a while afterwards and the water helps lessen this effect. If I had to describe this product in a single word I would say “addictive”. From the fresh vanilla scent to the delicious chewy texture, Clif and his company have truly crafted a masterpiece of sweet nutrition. If little frosting pieces didn’t break off and make little white smears on my clothes it would be perfect, but for those who aren’t messy eaters like me this won’t apply to you. In one bar (68 grams / 2.4 ounces) there are 270 calories. This figure should be judged differently than other sweet products, since the whole point of this bar is to give your body some nutrition so it can keep working, or start rebuilding muscle before you have a chance for a proper meal. Remember this type of product should never replace a real, complete meal with fresh vegetables, starches, and meat (if you aren’t a vegetarian, that is). There is of course the massive 20 grams of protein, plus 240 mg of salt (10% DV), 170 mg of potassium (5% DV) and 3 grams of fiber (12% DV). This is a big portion of sugar, 22 grams, which I don’t consider a bad thing if you are consuming this product during or after exercise. After all, your body does need some sugar to function properly. However, for this like myself who simply indulge in this as a tasty snack there may be a little guilt, especially given the sugar per weight (roughly 32 grams sugar / 100 grams total weight) is higher than many ice creams! Actually I take that back – this is one of the few products where you shouldn’t feel very guilty about the high sugar content. The reason is that there is several different sweeteners used, at least one or two of which has the potential to be healthier than your average added sugar: beet juice, brown rice syrup, and dried cane syrup. Sure, it may turn out that after all “sugar is sugar” and your body handles these roughly the same, but until that is 100% proven I think you’re better off with a variety of sweeteners as opposed to a load of everyday table sugar. Except for the “Natural Flavors” which I have a deep hatred of, the rest of the ingredients are very healthy. There is a mix of oils from natural sources (palm kernel oil, sunflower oil), natural seeds (flaxseed, quinoa), oats, almond butter, and almonds. The only other thing which is potentially unhealthy is the soy protein isolate itself, more because it is in super-concentrated form (and hence unnatural) than because of claims of soy’s effects on testosterone, which have for the most part been proven invalid. Complaining about this ingredient when it is the primary selling point of the product doesn’t make much sense, because those purchasing it know full well what they are buying. The full ingredient list is: Soy Protein Isolate, Beet Juice Concentrate, Organic Brown Rice Syrup, Organic Dried Cane Syrup, Palm Kernel Oil, Organic Rolled Oats, Almond Butter, Organic Soy Flour, Almonds, Vegetable Glycerin, Organic Quinoa, Organic Vanilla, Organic Sunflower Oil, Inulin (Chicory Extract), Rice Starch, Organic Flaxseed, Organic Oat Fiber, Natural Flavors, Soy Lecithin, Salt. Vitamins & Minerals: Dicalcium Phosphate, Magnesium Oxide, Ascorbic Acid (Vit. C), Tocopheryl Acetate (Vit. E), Ferric Orthophosphate (Iron), Beta Carotene (Vit. A), Zinc Citrate, Phytonadione (Vit.K1), Biotin, Niacinamide (Vit. B3), Calcium Pantothenate (Vit. B5), Potassium Iodide, Manganese Gluconate, Copper Gluconate, Sodium Selenite, Thiamin (Vit. B1), Chromium Chloride, Cyanocobalamin (Vit. B12), Sodium Molybdate, Folic Acid (Vit. B9), Riboflavin (Vit. B2), Pyridoxine Hydrochloride (Vit. B6). The long list of vitamins and minerals could be a blessing or a curse, depending on your stance regarding these food additives. I think they may help and are less likely to cause harm, and am therefore cautiously positive on them. Again, if you are the type of person who balks at vitamins added to a food product you wouldn’t likely be looking for a protein bar in the first place. 33% of the ingredients are Organic, which is nice bonus because the product is not openly marketed as a organic product. These are sold are various supermarkets, including Publix and Whole Foods Supermarket, from $2 – $3. If you buy wholesale online (in packs of 12), you can get the price down to $1.50 a bar. If you’ve looking for a great way to grab a load of protein quick during or after exercise, this tasty mix of mostly natural ingredients is highly recommended. Those with a sweet tooth who are less active should find it equally appealing as a delicious snack.